To make matters worse, I just couldn’t LET IT GO. I tried to relax with calming baths and even a little bit of scotch ;) but I would still head to bed stewing over the latest conflict and wake up all night from stressful dreams on the same subject. But after receiving a particularly abrasive email, I found a technique that seemed to help me calm down. Instead of writing a scathing response back, I approached my email with a sense of thankfulness. I thanked them for taking the time to express their thoughts in such detail. I thanked them for being patient with me while I learned a new process. I thanked them for their continued support as we evolved through this journey together. By the time I pressed the send button, I had released all of my anger. I went about my day without giving that situation another thought. This very specific thank you letter helped me release my anger in a way that my past gratitude journals could never supply. 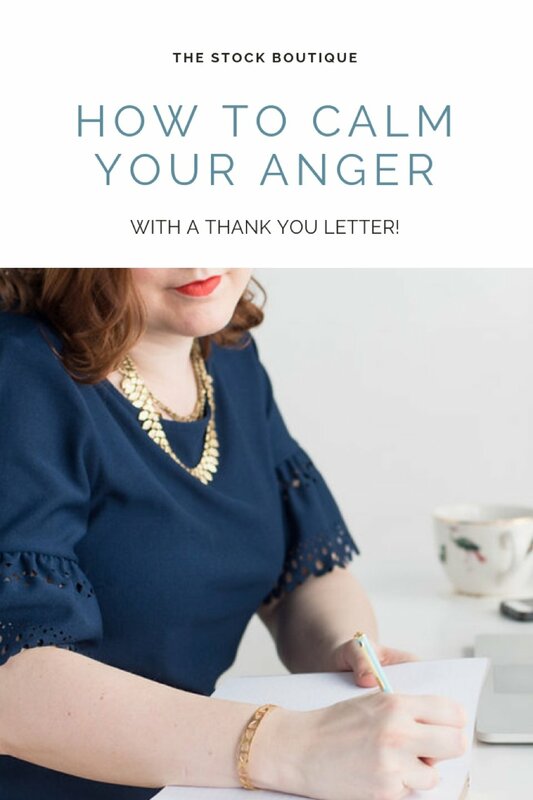 So, if you find yourself struggling with anger, I highly encourage you to write a thank you letter to that specific event. I promise, it’s worth trying! P.S- if you do find yourself getting frustrated about not having on-brand photos to slay in your business, try out our membership. At $25 a month and no long term commitment, it’s worth a try too!